Advantages of online transportation – Online transportation is the kind of transportation that receives orders from customers via smartphone applications with automatic cost calculation without involving bargaining. This kind of transportataion has growth rapidly in several countries, including in Indonesia. 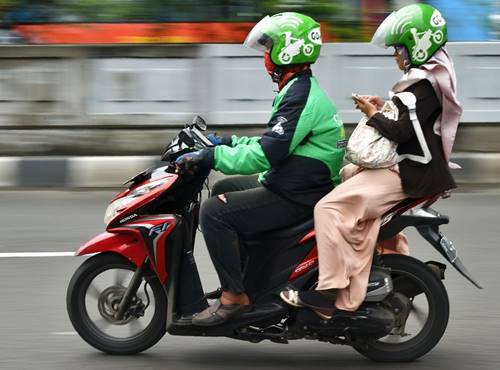 Online transportation already exists in Indonesia since 2010, but reached mainstream people in 2015. Some online transportation available in Indonesia are Go-Jek, Uber and Grab. In last couple years, online transportation become an option by people rather than public transportation. This fact can be seen by the emergence of online transportation in major cities in Indonesia such as Jakarta, Surabaya, Bandung, Makassar and Yogyakarta. People choose to use the online transportation rather than conventional transportation because of several advantages. There are three main advantages of online transportation in Indonesia, which are prices, flexibility and received the services of purchase and delivery. The first and main advantage of online transportation is the price. Each online transportation has its own method of calculation for the rate, which is calculated with a minimum distance of kilometers. Most of them have lower rates than conventional transportation services rates. All rates must be paid from the beginning, so there is no bargaining process with the driver. The interesting for passengers is when the “promo fare“, which the company of online transportation service providers charge flat rate that is low for the near or far distances. The services users should not afraid being cheated by the price, because everything is controlled from the head office. Second advantage of online transportation is flexibility. If normally you want to use some public transportation, you must go out from home toward the road to find the transportation. Sometime you may feel bored or tired for waiting the transportation in the road. This not including fact that public transportation have its own route that sometime not included our target location. But now, if you use online transportation via application, you can order and wait for driver at home or basically anywhere you want. The driver will come to you in couple minutes. It is very practical and the driver will prepare a helmet for you too, so you don’t need to bring your own helmet. In addition, online transportation can also reduce traffic jam and save your time. The last advantage of online transportation is not only take the passengers go to somewhere, but also received the services of purchase and delivery. For example you want to deliver something to somewhere, you can use online transportation to do it. Beside it, if you want to buy something or food but you are too busy or can not afford it, you can use online transportation services. They will buy it, and deliver it to you. Clearly online transportation like Go-Jek, Uber and Grab in the middle of great demand by society nowadays. Although quitely new, but they can steal people’s attention. This is because of many advantages of this transport rather than public transportation. It also can be predicted that the online transportation will have higher devotees everywhere. This kinds of online transportation will continue to create new innovations to attract customers at any time, especially there are advantages of online transportation in Indonesia. Things like this are very reasonable right now, the most important thing is people using new innovations like this wisely.